How better to wrap up the calendar year than by examining the president’s take on his relationship with the Supreme Court – especially because the court was one of President Donald Trump’s favorite topics of discussion this past year? These references ranged from the specific to the general and from praise to criticism. Many of the tropes are likely familiar. There was commentary on the Supreme Court vacancy after Justice Anthony Kennedy retired, more about Justice Brett Kavanaugh during the confirmation process, and a smattering of comments on a wider spectrum of issues ranging from the remaining justices to specific cases. 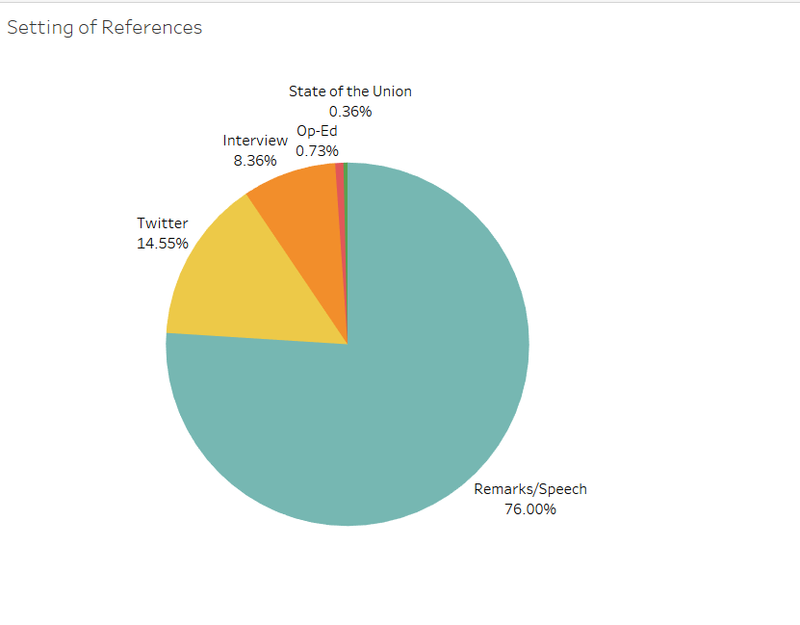 FactBa.se is a helpful resource that compiles Trump’s comments by cataloging speech transcripts as well as tweets and making them publicly searchable. Trump’s comments often coincided with various Supreme Court-related events in which he had a vested interest. Overall, and after eliminating duplicate observations, Trump made some 280 public comments in which he mentioned the Supreme Court between December 22, 2017, and December 22, 2018. 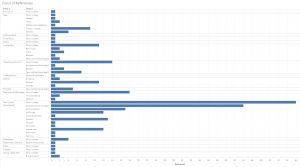 The frequency of these references by date is displayed below. The bulk of Trump’s comments came between Kavanaugh’s nomination and confirmation, with the most precipitous rising band coinciding with the confirmation hearing. While Trump made numerous comments relating to the court, many had striking similarities. 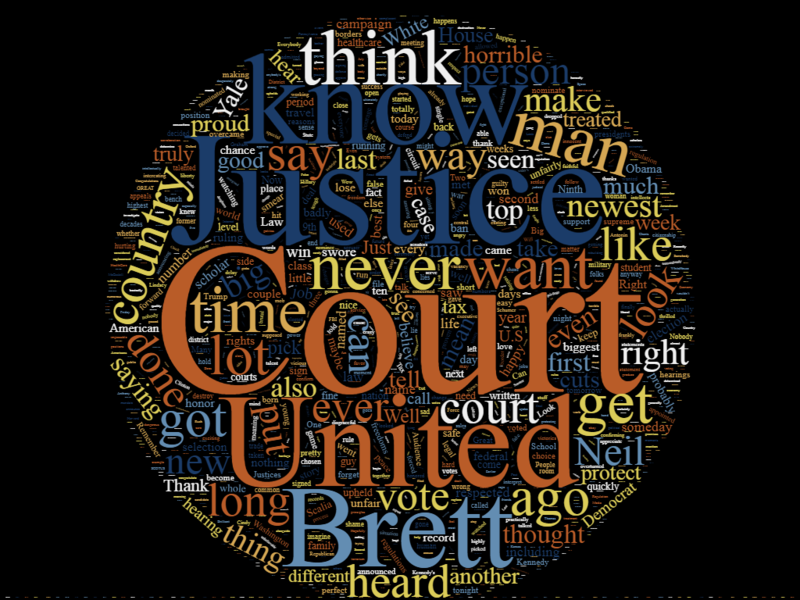 A wordcloud with text from all of these references helps probe the content. 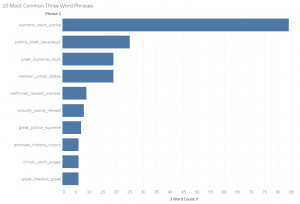 The size of the words relates to the frequency with which they appear in the data. 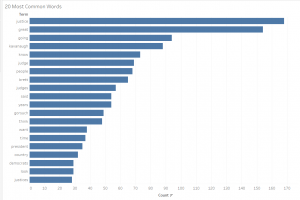 The size of “Brett,” for example, indicates that Trump frequently referenced Brett Kavanaugh. Other words like “newest” and “Yale” also relate to Kavanaugh, as he is the newest justice and a graduate of Yale Law School. Some of the words, like “horrible,” may require context to understand (Trump often described the Democrats’ treatment of Kavanaugh during the confirmation hearings as “horrible.”). 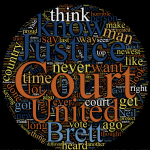 Because both of Trump’s Supreme Court nominees were men, the term “man” came up quite frequently and is prominent in the wordcloud as well. 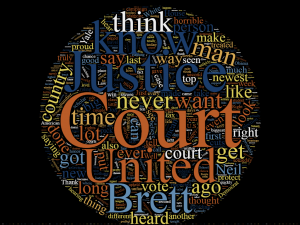 The actual term frequencies provide a quantified measure of the data in the wordcloud (The terms “Supreme” and “Court” were removed from these frequency measures.). The next figure has the most frequent individual words, with common stop words like “and,” “or,” and “the” removed from the set. Many of these terms appeared during discussions of the Kavanaugh nomination and often took place during commentary on the confirmation hearing. Multiple word phrases provide greater context for Trump’s words concerning the Supreme Court. 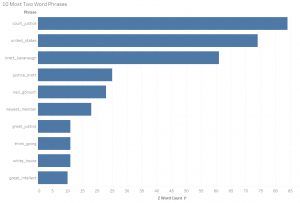 The most used two-word phrases or bigrams are shown below. 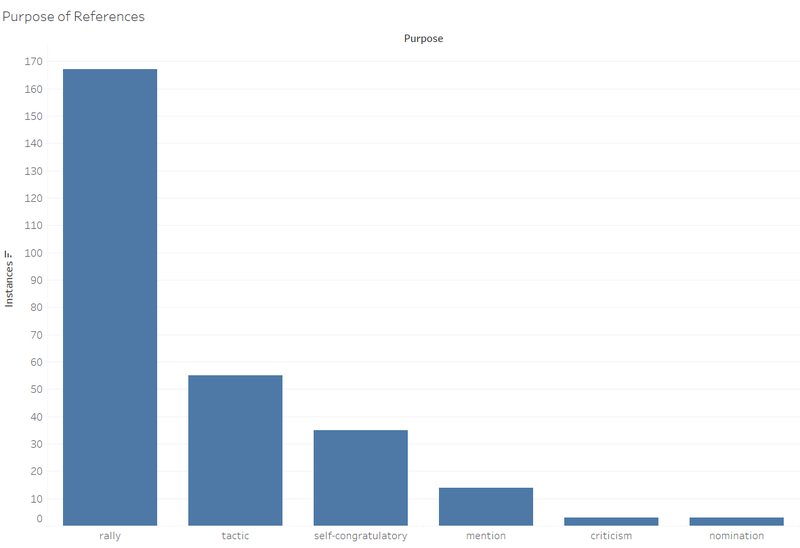 This list goes on, and the content of the top three-word phrases does not differ much from that of the two-word phrases (notice that “great intellect” comes up in the three-word phrases as well). Another way to parse Trump’s comments on the Supreme Court is not only by his actual words but by the focal point or intention of his comments. When these are laid out, several patterns become clear. Trump talked about the travel-ban case, Trump v. Hawaii, more than any of the other cases that he referenced specifically. He talked about Gorsuch more than other sitting justices before Kavanaugh joined the Supreme Court, and he talked about Kavanaugh more than any of the other justices over the course of the year. 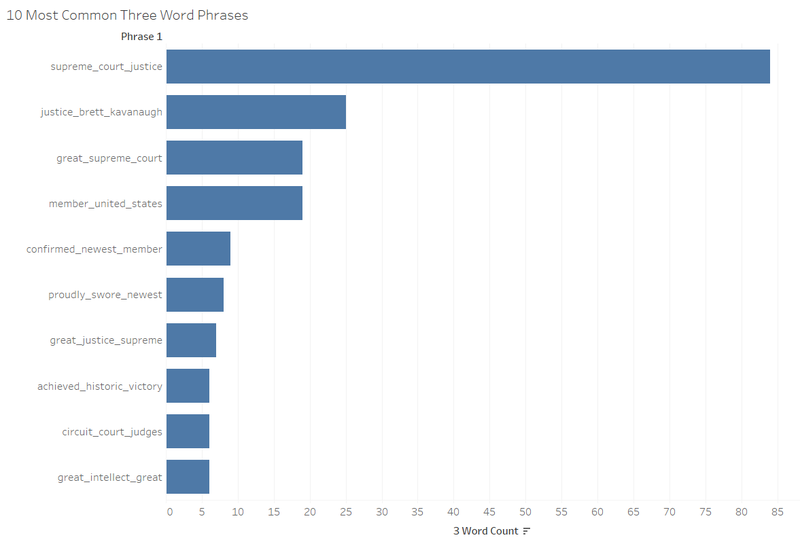 A bulk of the Kavanaugh comments came up during discussions of the sexual allegations against Kavanaugh that arose during the confirmation process. Trump also mentioned the importance of the court to his election agenda several times and discredited Democrats for overlooking the court as an election issue. The set of references was also organized by their purposes and settings. 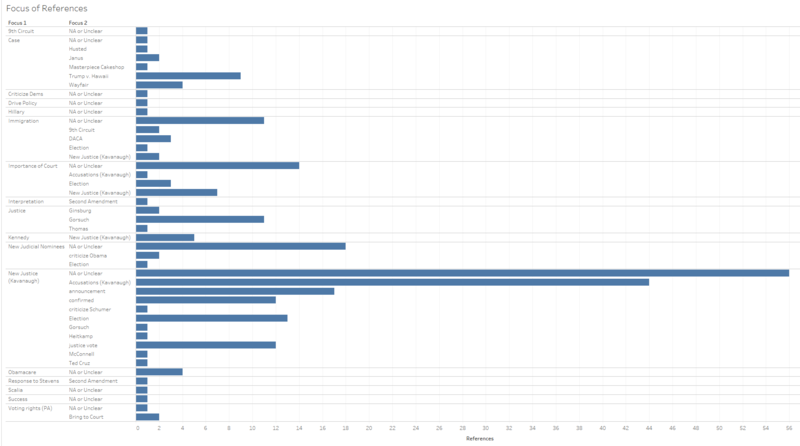 These purposes and settings predominantly clustered into limited types. Just under 15 percent of Trump’s comments relating to the Supreme Court were made on Twitter. A smaller portion were made during news interviews. Although the biggest issue linking Trump to the Supreme Court this year was Kavanaugh’s nomination and confirmation, this was not the only one. Trump talked about what would happen if the Deferred Action for Childhood Arrivals or asylum cases reached the Supreme Court, how the court would uphold his travel ban, and how the court might analyze his other immigration policies. He took the time to laud the court’s 5-4 conservative decisions towards the end of the 2017 term in Janus v. American Federation of State, County, and Municipal Employees, Council 31 and South Dakota v. Wayfair Inc., as well as the earlier decision in Masterpiece Cakeshop, Ltd. v. Colorado Civil Rights Commission. All in all, most of Trump’s statements regarding the Supreme Court were made with clear intentions. He was happy to praise the court when it supported his policy agenda, looked forward with hopeful anticipation to the court’s rejecting challenges to his agenda, and fervently supported his nominees to the federal judiciary. The post Empirical SCOTUS: 365 days of Trump and the Supreme Court appeared first on SCOTUSblog.